Shares of Valeant Pharmaceuticals tumbled on Wednesday after a research firm accused the drug company of massive fraud similar to what doomed Enron. It's the latest controversy swirling around Valeant (VRX), a $50 billion pharmaceutical giant that's backed by hedge fund billionaire Bill Ackman. Federal prosecutors are already investigating the way Valeant prices and distributes its drugs. Now Citron, a short-selling firm that actively bets against stocks and publishes negative research on companies, is making allegations that Valeant could be the "pharmaceutical Enron." Citron pointed to what it sees as a "web of deception" that amounts to "fraud" aimed at creating "invoices to deceive auditors and book revenue." Valeant called the report "erroneous" and said it contains "false and misleading statements" that appear intended to "manipulate the market" and drive down its stock price. 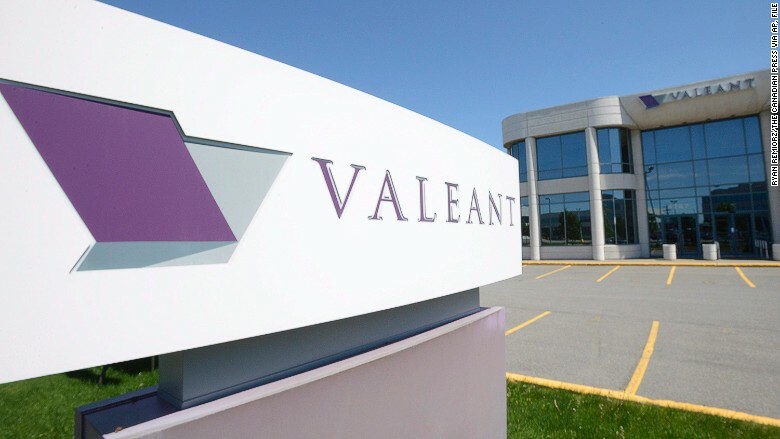 "We categorically deny the allegations," Valeant said in a statement. "We are confident in our full compliance with all applicable accounting rules, regulations and laws." The allegations seriously spooked investors. Shares of Valeant plummeted as much as 40% at one point. But shares came back from the brink as Ackman purchased two million more of the company's shares on Wednesday. A person familiar with the matter confirmed the purchase to CNNMoney. Ackman's Pershing Square Capital Management is one of Valeant's biggest shareholders. Pershing recently disclosed it owned over 19 million shares, or roughly 6% of the company's outstanding stock, according to FactSet. 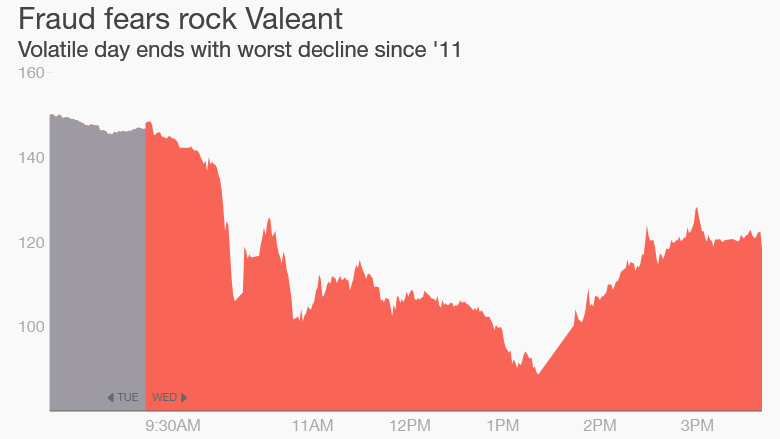 Valeant shares closed down 19%, their worst one-day percentage decline since 2011. "The stock is the ultimate verdict. Obviously people think they're onto something here," said John Schroer, a health care portfolio manager at Allianz Global Investors. Schroer said he does not own shares of Valeant nor is he shorting the stock. Citron alleges that Valeant created a network of phony pharmacies "for the purpose of phantom sales" and to avoid scrutiny from auditors. It specifically accused Valeant of hiding an improper relationship with two such pharmacies: Philidor and R&O Pharmacy. "This has the distinct aroma of product being jammed into a channel," Citron wrote. Citron repeatedly made comparisons between Valeant and Enron, the energy company that filed bankruptcy in 2001 amid massive accounting fraud. Valeant denied the charges, saying sales are only recorded when the product is dispensed to patients. The company said it properly accounts for sales to, and inventory, at Philidor and Philidor's network pharmacies. Valeant recently disclosed it owns Philidor. Citron fired back to CNNMoney with a one-word response to Valeant's denial: "Nonsense." The Securities and Exchange Commission declined a CNNMoney request for comment. Citron is an activist short seller with a team of investigators led by Andrew Left. This isn't the first time Citron has accused a health care company of shady behavior. The short seller noted in its Valeant report that in 2008 it exposed a relationship between medical device maker Arthrocare and Discocare. Top Athrocare executives were later found guilty of inflating sales figures and the company's former CEO was recently sentenced to 20 years in prison for securities fraud, according to media reports. The Valeant selloff infected other specialty drug stocks, including Horizon Pharma (HZNP), Mallinckrodt (MNK) and Mylan (MYL), which were all down at least 3% each. Shares of Allergan (AGN), which makes Botox, rebounded after the company sought to distance itself from Valeant by saying it does not rely on "specialty pharmacies" to distribute its products.